It’s 5 o’clock and while many people are leaving work and getting ready to unwind, you’re gearing up for another long stretch of your baby crying inconsolably for no apparent reason. Dubbed the witching hours, you wish a good witch would swoop in and nip these nightly crying episodes in the bud. If your baby cries for at least 3 hours, at least 3 days a week, for at least 3 weeks in a row, chances are that you’ve got a case of colic on your hands. Colic is ongoing, intense crying episodes that occur in otherwise healthy babies and has no obvious cause. Colic episodes are typically predictable, often happening in the late afternoon or evening. Not all colicky babies follow a schedule though, and episodes can start anytime, even in the middle of the night. 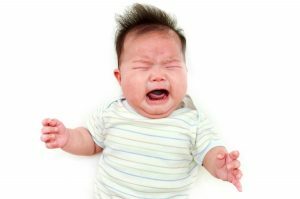 Babies with colic may wriggle, cough or spit up while crying, and it may disrupt feeding and sleep. Colic affects 1 in 5 babies, peaks around 6 weeks, and generally stops by 3 to 4 months—either tapering off or stopping suddenly. Heightened Sensitivity – Some theorize that certain babies are more sensitive to stimuli and until they learn to filter out sights and sounds, they react by crying for long stretches of time. Tobacco Exposure – Studies suggest that babies born to mothers who smoked during pregnancy, or babies who are exposed to secondhand smoke are at increased risk for colic. Infant Reflux – If your baby shows signs of infant reflux, you can try treating it to see if the crying spells go away. Food Sensitivities or Allergies – If these are the cause of frequent crying, it’s likely your baby will have other symptoms as well. According to the Children’s Hospital of Philadelphia, a breastfeeding mother can remove common offenders (dairy, eggs, nuts, peanuts, soy, wheat) from her diet and wait 1-2 weeks to see if the crying and any other symptoms of food sensitivities or allergies disappear. If your baby drinks formula, ask your doctor about switching to another type. Gas Pain – Many pediatricians question whether gas pain causes a baby to cry a lot, or crying a lot causes a baby to swallow air and have gas pain. There are over-the-counter medications for baby gas that you can try, but be sure to talk to your pediatrician before giving your baby any type of medication or supplement. Imbalance of Gut Bacteria – Research suggests that colicky babies may have an imbalance of gut bacteria that causes tummy pain. Ask your pediatrician about giving your baby probiotics to rule this out. Environmental Stress – Edelstein suggests tracking colic episodes to look for possible crying-spell triggers. If you notice a pattern, like colic starting right after older siblings return home from school, look for ways to make that time less stressful and see if your baby cries less. What Can I Do to Calm My Baby? Use movement. Try putting your baby in a stroller and taking him for a walk outside, or putting him in a carrier and walking around the house. Some parents say that holding their baby while gently bouncing up and down on a large exercise ball is helpful. Remember to never shake your baby. A baby crying for hours at a time is understandably frustrating. If that frustration feels like too much, you can place your baby in a safe area, like his crib, and take a break. Play music, or white noise from an appliance or dedicated white noise machine. Wrap him in a swaddle. Sing to him, or make the sound “shhh” near his ear. For most parents, the months after having a new baby are an adjustment as everyone figures out how to function on less sleep, develop new routines, manage worrying about baby’s health and development, tend to siblings’ needs, and keep communication open between parents and other caregivers. Phew! Add colic to that mix and the adjustment can become overwhelming. Our article on coping with colic offers lots of suggestions for keeping your sanity during this difficult time.